This is the very first photo I took with my new camera! Yup, Hubs and I had been talking about my upgrading for a while now, and I finally, on my birthday, decided I should do it. I ordered it a few days after that, and took my very first photo with the Sony a580 yesterday morning. BEautiful bloom of chicory! Your new camera took an awesome picture, with your expertise behind it! I love chicory!! So glad to meet people as crazy about it as I am!! And congrats on the new camera!! Love how crisp and sharp this looks! That's a great birthday gift Misty and it sure takes beautiful photographs. Such a pretty flower, love it! A Very Happy Belated Birthday! 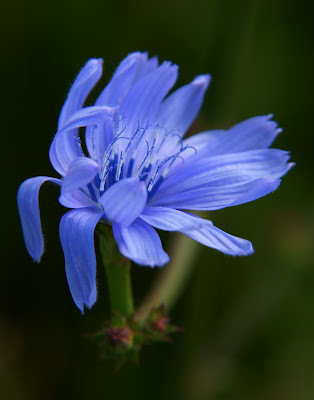 Chicory - one of my favorite flowers and you really captured it!